Have you ever found yourself in the situation that once you’ve finished the fitting and joining of your wooden project you can’t seem to get that smooth, glossy and perfected finish? Then this newsletter is your one-stop shop! In this feature, we’ll cover how to achieve the highest-quality finish possible for your project. Whether woodworking is your hobby or you’re a professional fitting a new kitchen for a customer, this blog will guide you through the best processes for finishing solid surfaces. Different types of surfaces will need individually tailored approaches to the finishing process, and of course, personal taste is also a factor in deciding what sort of finish is desired. With a matte finishing of glue joints, for example, the best practice is to use medium to fine grits, the same applies for the removal of deep scratches. We recommend using our Premium Velcro Discs in grit P180 – P500 to blend glue joints and to remove any significant imperfections. Then to achieve a flawless matte finish, use a P800 disc across the surface and remember to respect the grain. If matte isn’t your thing, then by continuing through grits P800 to P2000, a satin finish is readily achievable and is incredibly smooth to the touch. If operating on a plain surface without any glue joints or imperfections, then you can skip the first step and start with P500 Premium Velcro Discs. This infographic shows various surfaces and the suggested steps to take with each. If you happen to be working on a curved surface, or one with a profiled edge, then more can be done to achieve a desirable satin finish. 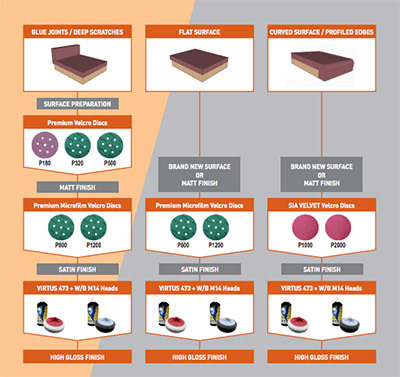 Use Sia VELVET Velcro Discs in grit P1000 – P4000 on these surfaces. Sia VELVET discs are perfect for sanding those hard to reach areas and have a minimal scratch depth. To further ensure better contact of the abrasive is kept with the flow of the surface on more difficult contoured surfaces, use a FinishLine interface pad with the Sia VELVET disc. Again, if the surface is without any scratch damage, you can skip the first step. For a high gloss polish look, there is no better product to use than the Virtus 473 ceramic liquid compound. Using a professional grade polisher on low speed with a White Compounding Foam head attached, P1500 abrasives marks are removed from the surface quickly and easily. Afterwards, apply Virtus 473 coupled with a Black Polishing Foam head to buff the surface to an ultra-glossy finish. We recommend using the Rupes LH18 110V Variable Speed Polisher with the products in this step due to its excellent low-speed polishing performance, especially under heavy load. Once thoroughly polished, you will have achieved a high-gloss finish with no compromise on quality. If any of the substances mentioned above have got on your hands during the process, then there is no better hand cleaner than Dreumex Expert to wash away the excess. The industrial strength handwash cuts through the toughest of lacquers, paints or inks with ease while being solvent free and ultra-skin friendly. To purchase any of the products listed above or for more information on them and this process contact sales@abconireland.com, or call (049) 555 2340 today!